Ellsworth McKee had a tower built in the center of his house which is one of the unique aspects of his $3,790,000.00 mansion in Ooltewah, which is up for sale. McKee, the chairman of McKee foods, and his wife are looking to downsize. Ellsworth McKee grasped the frayed length of rope and pulled it first to the left, then to the right, then back to the left again. As he rang the bell of his personal steam engine, he smiled. McKee, 79, always liked trains. But until his retirement, he had little time for Amtrak. The son of McKee Foods' founder O.D. McKee busied himself for years with the sale of Little Debbie snacks, growing the Collegedale-based company into a $1 billion-plus behemoth. To enjoy the feeling of cross-country rail travel without leaving home, he decided to install his own train at his $3.79 million, 4.28-acre Ooltewah estate. "This was all farmland when I got here," McKee said, waving his arm at the golf course and neighborhood in the distance. The house and grounds, which are for sale, include a coal-burning steam engine that travels along 800 feet of track. As the steam engine loops around the property, it passes through a tunnel, stops at a mini-station and fills its boiler at a real water tower. "It takes about an hour to get it heated up and another hour afterward to get it cleaned out," he said. The small train is modeled on The General, the steam engine involved in The Great Locomotive Chase in northern Georgia. During the chase, a group of Union Army volunteers commandeered the locomotive and fled north to Chattanooga. Though the saboteurs didn't make it to the Scenic City, the story has inspired generations of train aficionados. McKee, like many fans of the iron horse, always dreamed of opening the throttle of his own locomotive, listening to the chuff chuff of the steam-driven pistons as the wind whipped through his hair. The playset is a child's dream, but few children have used it, as evidenced by the lack of scuff marks or broken fixtures in the miniature train station. "When we were planning the house, we had four kids at home," he said. "When we finished it in 1991, they had moved out." Today, his privately-held company employs some 5,800 workers, producing more than 160 types of snacks for the North America market. McKee is semi-retired now, serving as company chairman. His daughter, Debbie, was the model for the company's well-known Little Debbie trademark. The original photo of Debbie still hangs in the family's domed conservancy. But after more than 20 years in the house, it's time to downsize, McKee said. He wants something that's easier to maintain. On Thursday, a dusting of grass clippings clung to the shoulders of his white button-down shirt as he stood near his train tracks. He still keeps up with the work at the 14,000-square-foot home, though he's not enjoying it as much as he used to. "When about half of your friends have moved into retirement homes, it's time to move on," he said. Trudging around the yard, he found a metal cover on a utility line out of place and wrenched it back into position. He still cares about his dream home, even as he prepares to leave it. Asked to pick a favorite feature, McKee is hard pressed to name just one thing. "This is way nicer than the house I lived in on Dodds Avenue," he said wistfully about the Chattanooga location. "That house was so nice, they tore it down when we left." The Dodds Avenue house, which he occupied with his wife, Sharon, was located next to what was then the McKee Foods bakery on Dodds Avenue. Because the home wasn't insulated, the family's wood-burning stove didn't do much against the cold Chattanooga winters, he said. "We'd stand by the pot-bellied stove and your front would be burning while your back was freezing," he said. "When we got so hot that we couldn't stand it, we'd turn around and work on the other side." He also lived briefly in East Ridge and near the Collegedale Airport in what he describes as a log cabin. "We were quite poor when we were first married," McKee said. "Things didn't really turn around until we moved into that log cabin." Those houses are a far cry from the eight-bedroom, eight-and-a-half bath residence he's about to sell. 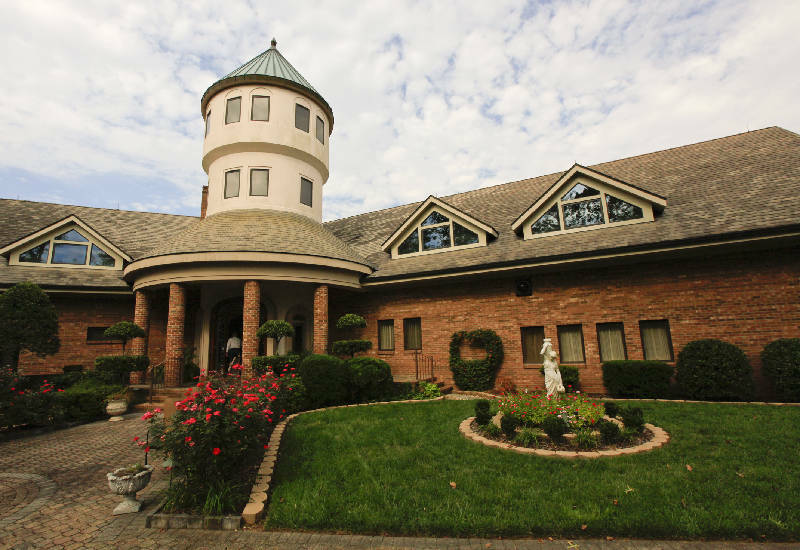 The McKee home, one of the biggest in Hamilton County, also includes a five-car garage, a hot tub and a sauna. There's even a safe room for tornadoes and the like. The insulation here is, if anything, a little too effective. McKee even had a trap door installed so that when it rains, he can open the hatch and expose the copper roof overhead. Doing so allows him to hear the rain drops from his bedroom when he's going to sleep. The entire rear of the house overlooks a natural bay on the Tennessee River, beyond which lies 221 acres owned by Uncle Sam. It's an oasis of beauty in what has turned into a popular residential area. "We've sailed from this boathouse down the river to Alabama, Kentucky, as far as you want," McKee said. Up top, a winding wooden staircase leads to a telescope pointed at the moon. Hand-carved roses adorn the wood pillars that support the roof. It's the kind of house where people remove their shoes before treading on the immaculate cream-colored carpet. There are little slip-on booties for workers or other visitors. When McKee isn't relaxing in the den by the fireplace, his favorite spot, he ventures down to the basement where a tiny train circles the ceiling at the flip of a switch. Model cars, puzzles and other toys are kept down here. Wearing a characteristic grin, McKee spins a tiny knob and the train speeds up. A spiral staircase, one of several in the house, leads from his office up to his bedroom. Near the large desk, there's a model of the '57 Ford convertible that McKee bought when the future of the bakery was still in doubt. When he approached a salesman to buy the car, the man looked at McKee, wearing ordinary street clothes, and refused to show him how the hard top was operated. "He figured I was wasting his time," McKee said. McKee came back a few days later and bought the car with cash from a different salesman. "It doesn't mean that we were doing well at the time," he said. "But we were very thrifty."